Max Weber is indubitably one of the very greatest figures in the history of the social sciences, the source of seminal concepts like 'the Protestant Ethic', 'charisma' and the idea of historical processes of 'rationalization'. But, like his great forebears Adam Smith and Karl Marx, Weber's work always resists easy categorisation. Prominent as a founding father of sociology, Weber has been a major influence in the study of ancient history, religion, economics, law and, more recently, cultural studies. This Cambridge Companion provides an authoritative introduction to the major facets of his thought, including several (like industrial psychology) which have hitherto been neglected. 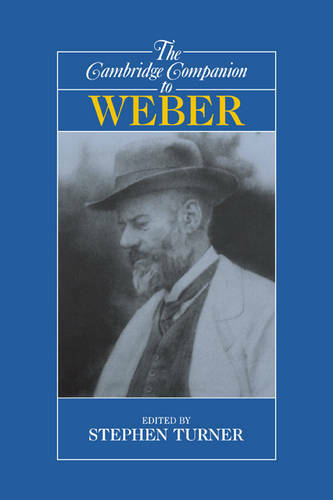 A distinguished international team of contributors examines some of the major controversies that have erupted over Weber's specialized work, and shows how the issues have developed since he wrote. The articles demonstrate Weber's impact on a variety of research areas.